at the 6th annual Made In Kingston event! We’re returning to The Metro!!! Join over four dozen local artists and businesses at an expo of all things made right here in the City of Kingston! We’re returning to The Metro, the former MetLife building currently under development by RUPCO in Midtown. Free and open to the public, the event includes live music and a fabulous way to SHOP LOCAL for the holidays! Food and beverages will be available for purchase from one of our wonderful Kingston eateries, including Peace Nation, PAKT, Ruby Mae Soul Food, Turn Up the Beet, Tubby’s, Local Artisan Bakery, and Keegan Ales. New this year is a focus on sustainability, including priority parking for carpoolers, a bike rack, and a partnership with Zero To Go to help collect and sort compostables, recyclables, and landfill trash. We will also have a free shuttle bus between the municipal lot on Cornell Street and The Metro, running continuously from 4pm to 8pm. 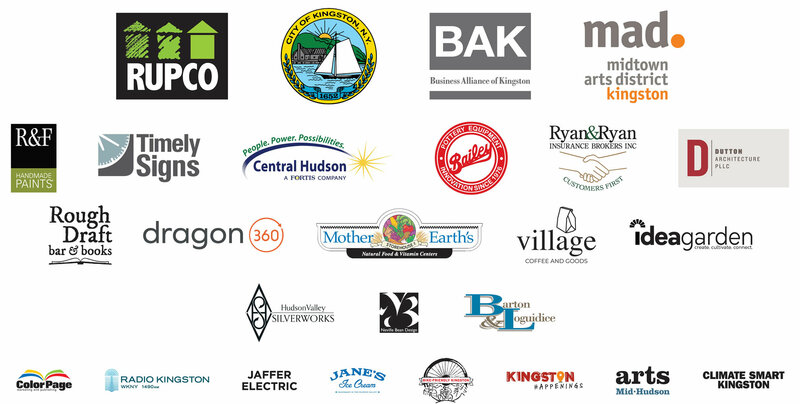 A huge THANK YOU to our sponsors: Bailey Pottery, Barton & Loguidice, Hudson Valley Silverworks LLC, Neville Bean Design, Central Hudson, Dragon360, Dutton Architecture, Mother Earth’s Storehouse, R&F Handmade Paints, RUPCO, Ryan & Ryan Insurance, and the City of Kingston, AND our Zero Waste sponsors: Rough Draft Bar & Books, the idea garden, Village Coffee and Goods, and Climate Smart Kingston. This project is also made possible in part through support from the County of Ulster’s Ulster County Cultural Services & Promotion Fund administered by Arts Mid-Hudson.